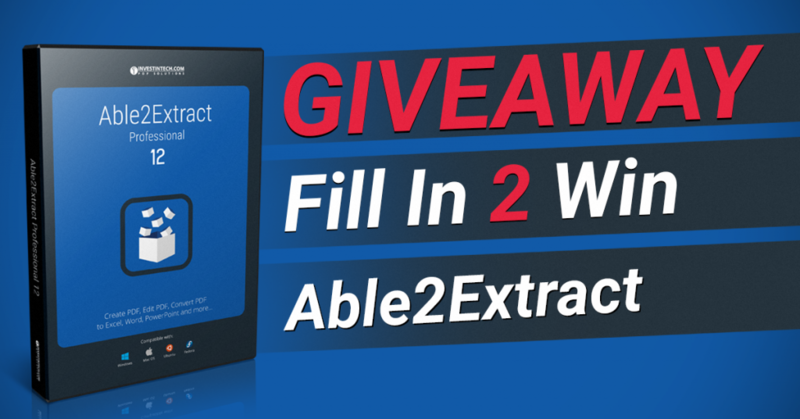 UPDATE: The Able2Extract 12 giveaway is now officially closed. Thanks to everyone for participating and making the giveaway a success. We’ll be announcing winners May 4th. Stay tuned for the announcement to find out if you’ve won. Good luck to all! Would you like to get a professional productivity-boosting software that can help you to get the most out of your PDF files for FREE? Yes? Well, today is your lucky day! Don’t miss out on the exclusive opportunity to win a lifetime license for Able2Extract Professional 12 valued at $149.95. The giveaway of 5 (five) Able2Extract Pro 12 lifetime license PINs will last for 3 weeks, starting from today – April 10th. Entries can be submitted until midnight April 27th, Eastern Standard Time (EST). We’ll announce the end of the giveaway and giveaway winners on all of our social media accounts and by updating this blog post. “Fill In 2 Win” giveaway is organized with one goal in mind – to show appreciation to our social media followers worldwide. Even though there’s no geographical restriction for participating in the giveaway, valid entrants must be the age of majority in their respective countries. Investintech’s or any affiliated organizations’ employees are not eligible to enter or win. Please note that newly created or duplicate social media accounts will not be eligible. Our team will thoroughly check every entry to make sure the contest is fair and all participants have an equal chance at winning the lifetime license for Able2Extract Pro 12. Download the entry PDF form (made with Able2Extract) and fill it in with the tool of your choice. This is just an example. Fill in the PDF form appropriately and answer the last question correctly before submitting the form. All fields are required. Entry limit is 1 (one) per person, email, and social media account. Personal information (name, email address, SN handle) collected with this form will only be used for the purpose of determining the giveaway winner. Collected information will not be used for any other purpose or disclosed to third parties. We will pick 5 random winners from among all eligible entries. Winners will be announced on May 4th on Facebook, Google+, and Twitter. They will also be notified via email provided in the entry PDF form. 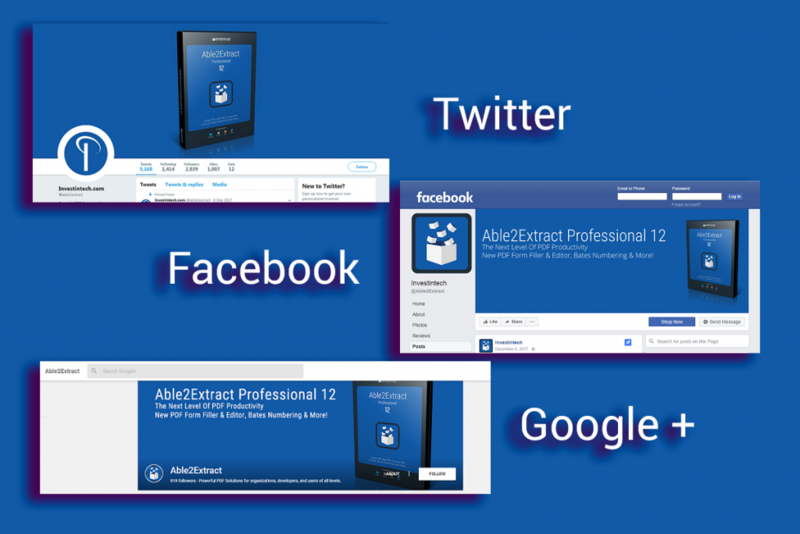 Each winner will receive 1 (one) lifetime license PIN for Able2Extract Professional 12 after they validate email address and social network handle they stated in the entry PDF form. Investintech wishes all participants the best of luck – let the giveaway begin! No purchase necessary to enter or win the Sweepstakes. Void where prohibited by law. You can find “Fill In 2 Win” Official Rules here. By entering, you agree that you have read and agree to all of the Sweepstakes rules.